Ostrich looks and tastes similar to beef but is lower in fat than chicken or turkey. A red meat very low in fat and high in protein. 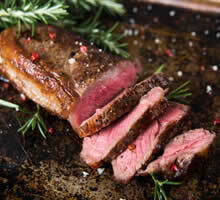 Premier Ostrich Fillets, individually vacuum packed for freshness, 120g, 150g, 180g, 200g and 220g. 100% minced Ostrich Steak.Try Ostrich Mince as the low fat alternative in any Beef or Lamb recipe (250g). Now available Gluten Free Ostrich Burgers. Packed in 2's, 12's and 24's. Why not try our low fat Ostrich & Tomato Sausages, 6 sausages packed in a tray and sealed for freshness. Why not try our low fat Ostrich Sausages, 6 sausages packed in a tray and sealed for freshness.